When The Nelson-Atkins Museum of Art opened its doors in 1933, volunteers were present to educate the public about the new collections. Eighty-five years later, the Volunteer Docent Program at the museum continues to play a central role in helping visitors of all ages make powerful and lasting connections with works of art. 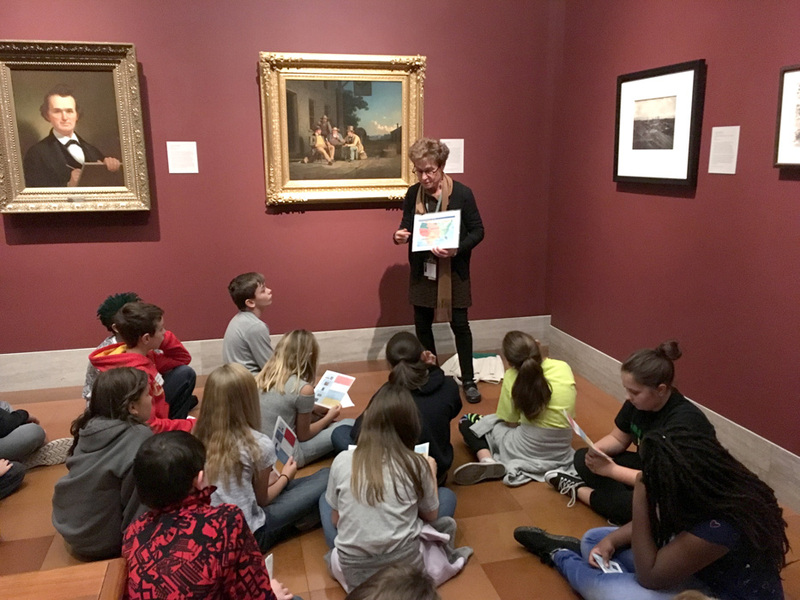 The story of the Docent Program is one that reflects the evolution of the Nelson-Atkins, changes in art education and a continued commitment to teaching and learning. The museum’s first docents were members of the Junior League of Kansas City, Missouri, a women’s organization that supports a range of community organizations through volunteer service and philanthropy. 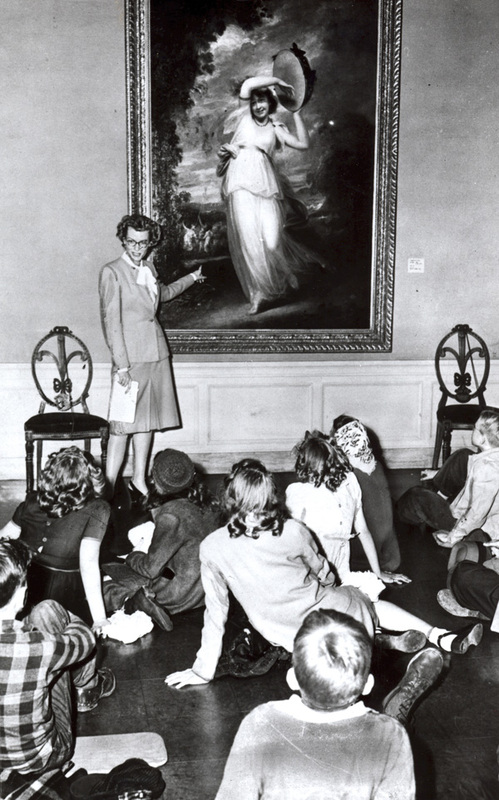 In 1934, Frances O’Donnell, the Nelson-Atkins’ first education director, began to develop a Docent Program that would serve as a model for museums across the country. The first class of 16 docents was trained in 1935 and by 1949 over 60 Junior League members were providing tours for visitors. Other community organizations that provided volunteers over the years include The Junior Leagues of Johnson County, Wyandotte County, and Independence; the Independence Service League; the Leawood Women’s Club; the Girl Scouts; the Young Matrons and the Friends of Art. The Junior League’s formal role in the Docent Program ended in 1974 and the Friends of Art, a museum support group, became the sole source of volunteers until it merged with the Nelson-Atkins in 1986. In the early years, the dress code for docents was attire that would be appropriate for “going to church or working in a bank.” No hats, gloves or purses were allowed, as the docent was considered a “hostess” and a hostess wouldn’t don those accessories in her own home. Controversy arose when pants became acceptable “ladies wear,” but eventually docents were allowed to wear pants with a matching jacket. In the 1960s, mini-skirts were banned but go-go boots were permitted. In 1985, the Nelson-Atkins began to formalize the Docent Program by creating an application process, defined duties and expectations, and more intensive training. Today, docents receive training from curators, educators and outside specialists on the history of art, objects in the collection and education theory and pedagogy. Tours have evolved from a lecture-style format to more interactive, inquiry-based experiences that engage visitors in close-looking and making personal connections with works of art. In the last year, docents provided tours to over 28,000 schoolchildren from Kansas City and beyond. These tours are developed by Nelson-Atkins educators and docents in consultation with area teachers. Tours are designed to help students hone their visual literacy and critical thinking skills, while providing connections to national and state standards in art, social studies, language arts, and even science and math. For example, in a Making of America tour, students investigate how American culture, events and ideas in U.S. history are expressed in works of art through descriptive writing and dialogue. 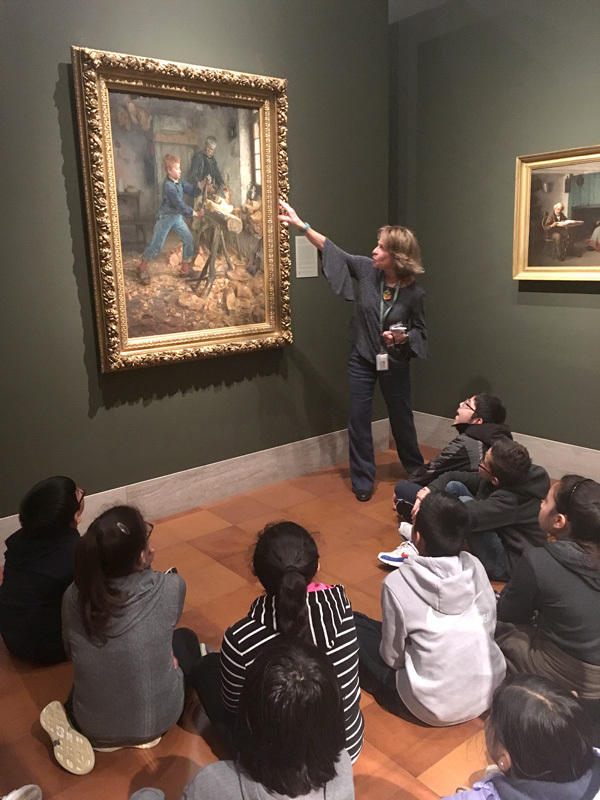 Docents who teach the Thinking Through Art program visit classrooms 12 times during the year and engage students in Visual Thinking Strategies (VTS), a research-based teaching approach that activates transformational learning through facilitated discussion. Students in this program also visit the museum twice during the year for docent-led tours. Docents also provide tours to over 15,000 adults each year. In partnership with the Alzheimer’s Association Heart of America Chapter, the Nelson-Atkins offers docent-led tours for adults with memory loss and their care partners. Called Minds in Motion, these tours are designed to stimulate memory retention and facilitate connections among people who often feel isolated. Docents are preparing for a new tour called Art Beyond Sight, which will offer visitors who are blind or have low vision the opportunity to experience works of art through touch and innovative new technologies. Docents also lead Medicine in Art tours with students in UMKC’s Medical Program to help them develop the observation and empathy skills that are becoming increasingly important in the medical profession. The Nelson-Atkins Docent Program has a deep impact on the Kansas City community, and it is also regarded as one of the strongest programs of its type in the country. The quality of the program and the stellar leadership are just two of the reasons that the Nelson-Atkins was chosen as the host museum for the 2021 National Docent Symposium, a bi-annual conference for volunteer educators to share teaching practices, experience other museum collections and dialogue with other docents. The theme for the Kansas City symposium is “Get Creative. Get Inspired. Get Kansas City” and will introduce attendees to the cultural treasures of the city and highlight the innovation and creativity of Nelson-Atkins docents. Nelson-Atkins docents have inspired and transformed visitors for over 85 years. If you haven’t experienced a tour recently, join one of our skilled docents for a free walk-in tour. Check nelson-atkins.org/tours for dates and times.